Kim Woo-bin, Suzy, Lim Ju-hwan and Lim Ju-eun to star in "Uncontrollably Fond"
Actors and actresses Kim Woo-bin, Suzy, Lim Ju-hwan and Lim Ju-eun are starring in "Uncontrollably Fond". According to drama officials, the four had a meeting with the production team on the 10th and the results were encouraging. "Uncontrollably Fond" is about a man and a woman with a painful past reuniting as a super star and a documentary PD. This drama is written by Lee Kyeong-hee who also wrote "Nice Guy", "Thank You", "Sorry, But I Love You" and more. Kim Woo-bin is playing the super top star named Sin Joon-yeong, a singer and actor. He is good looking and intelligent at the same time. Suzy attempts a completely different character role named No Eul, a documentary director. Her sense of justice is fragile in front of money and she's fragile in front of those who are stronger than her. Im Joo-wan plays Choi Ji-tae, director of headquarters in KJ Group. He is good looking, skilled, has a great personality and is from a rich family. He's gentle and sweet and is modest. Lim Ju-eun is the team director of KJ Cosmetics named Yoon Jeong-eun. She's the daughter of a mother who turned her father into a strong candidate for presidency and has produced prime ministers for generations. She was born in a royal family. 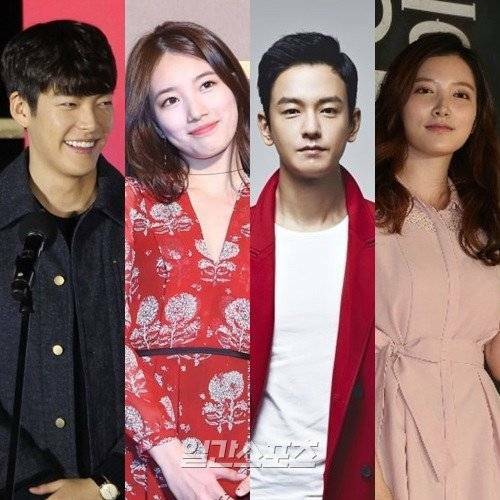 "Kim Woo-bin, Suzy, Lim Ju-hwan and Lim Ju-eun to star in "Uncontrollably Fond""